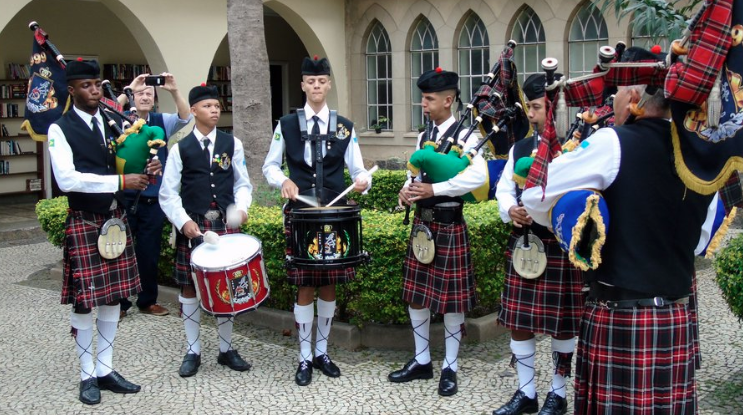 Resplendent in their kilted uniforms, the boys of the Brazilian Pipers Pipe Band, based in São Gonçalo, have become a regular and very popular attraction at BCS events, with their lively display of foot-tapping Scottish and Brazilian tunes. Not many of us will be aware that it’s twenty years now since the band was inaugurated by retired Fusileiro Naval officer José Paulo Perreira Filho as a social project to develop and create opportunities for teenage boys from one of the poorest, most densely-populated and violent areas of Rio de Janeiro. Its success could be measured by the quality of the military Guard of Honour made up of ex-pipe band members at the twenty-year commemoration ceremony on Saturday February 2nd at the Clube Tamoio in São Gonçalo. Two of them now serve in the Presidential Guard, Brasilia, while others have joined the Fusileiros Navais. 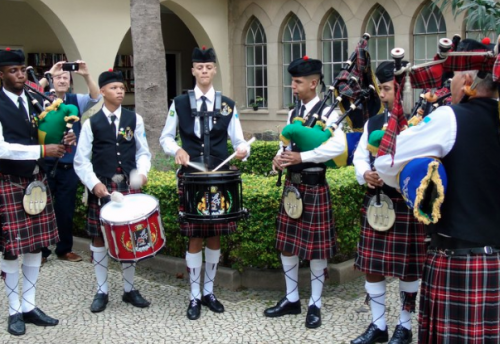 I was first introduced to the band when I was Master of Ceremonies at the sixth South American Pipe Band Gathering in November 2015, when it was hosted in Brazil for the first time, in São Paulo, organized by Cristiano Bicudo. 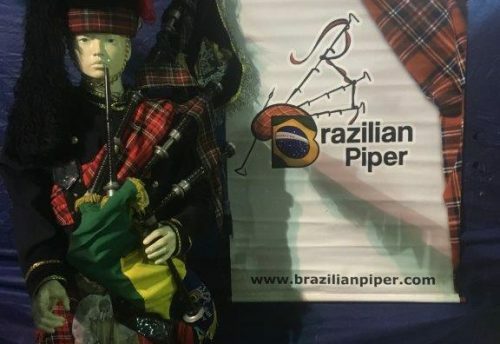 As the fierce competition for trophies between pipe bands from Argentina, Chile, Peru and Brazil came to a close, there appeared one more band which was not included in the competition programme. 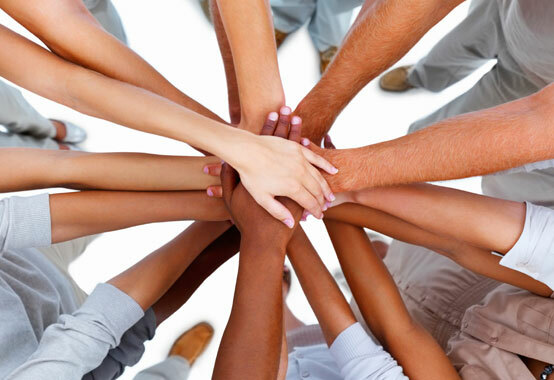 It’s against the principles of the project for the band to be competitive. Nevertheless, it was these boys from São Gonçalo who had all the competitors, judges and spectators clapping and dancing to their mixture of Scottish and Brazilian popular tunes, with a well-deserved standing ovation at the end. The same performance was repeated at the seventh South American Pipe Band Gathering at Santiago in 2017. Preparations are currently under way for the eighth gathering in Bariloche, Argentina, scheduled for October 2019. Since 2016, the boys have been coming along to the weekly Scottish Country Dance sessions at the Paissandu Club, Leblon, ostensibly to learn a bit more of the culture of the land of their instrument, and to practice a bit in the open space available at the club. They are extremely well-mannered and join in the dancing with great enthusiasm, adding a very welcome youthful atmosphere to the Tuesday night sessions. 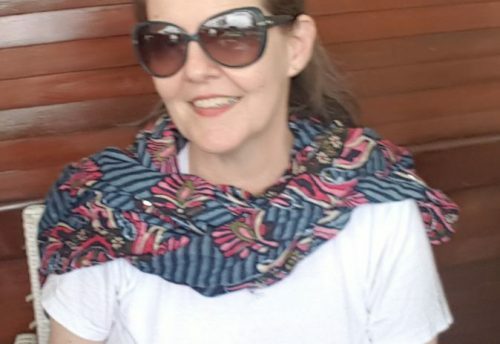 Moreover, they have taught the dances to their sisters and girlfriends, so that Scottish Country dancing is now all the rage over in São Gonçalo, much to the delight of our dancing mistress Audrey Hieatt. Fast forward to last Saturday at the twenty-year anniversary of the band. Cristiano Bicudo, Audrey Hieatt and I received commemoration certificates and medallions for our support. Cristiano Bicudo, founder of the first pipe band in Brazil and holder of the prestigious Glenfiddich Balvenie Award for outstanding services to international piping, has been the driving force behind the development of piping in Brazil for over thirty years – a truly remarkable achievement. Further information can be found on the Brazilian Pipers Facebook page where there’s a video clip of the stunning opening ceremony of the band’s 20-year anniversary, to the music of “Game of Thrones”, along with more information on the band’s programme of performances in 2019.